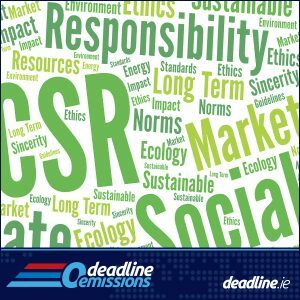 Deadline is committed to sound environmental practice and conducting business in as least environmental impactful as possible. In this document, we have outlined our principles as we have a direct responsibility for the environment. We will always carry out our business as responsibly as possible. This document outlines our long-term commitment to updating our principles continually in light of advances in new technology and in the understanding of health and environmental science. We will minimise, and wherever possible, eliminate the release of any pollutant that may cause environmental damage to the air, water, earth or its inhabitants. We will minimise the creation of waste, and wherever possible recycle materials and encourage others to do likewise. We will dispose of our waste in a safe and responsible way. We will make every effort to use environmentally safe and sustainable energy sources. We will invest in and promote the benefits of improved energy efficiency, particularly when it comes to transport and vehicle emissions. We will minimise the risk of environmental damage by employing safe technologies and operating procedures. We will deliver services that minimise adverse environmental impacts. We will include environmental standards in all contracts and service level agreements. Within the terms of the law, we will make provision to ensure that contractors working on the company’s behalf apply environmental standards equivalent to the company’s own. We will ensure that all staff and members are aware of their environmental responsibilities in terms of these principles. We will conduct and make public a periodic self-evaluation of our progress in implementing these principles and in complying with applicable laws and regulations.